If you sit too close to the fire, the sparks will get you. José and Lucy never went on a second date because there was no spark. The CEO's attitude caused a spark of anger in all his employees, but nobody could say anything. The metal started sparking as soon as the mechanic turned on the machine. The new taxes sparked a riot. Sparkle is a related word that means ‘to emit or reflect bright points of light.’ Because the points of light change position, they can seem a bit like sparks being emitted by a fire. A spark is also an old-fashioned word for an elegant young man who is too concerned about the way he looks. People don’t use this anymore but you might see it in older novels. We can also call this kind of man a fop. Spark dates back to before the year 900. 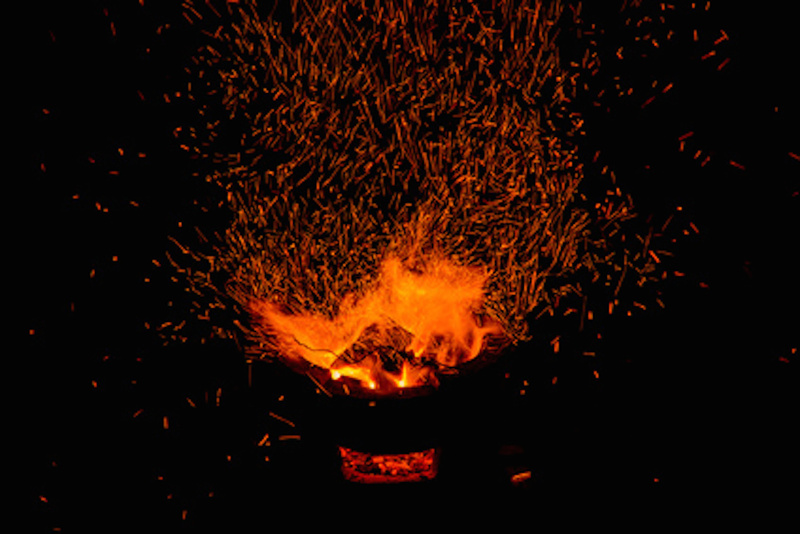 The Old English noun spearca (Middle English sparke or sperke) literally meant ‘a fiery or glowing particle thrown off from a fire,’ and can be traced back to the Proto-Germanic sparko or sprako and the Proto-Indo-European root sperg– (to strew or sprinkle). Spark is related to the Middle Low German sparke, the Middle Dutch spranke and Dutch spark (all meaning spark), as well as the Sanskrit parjanya (rain or rain god), the Avestran frasparega, (branch or twig), the Persian parākan, (scatter or spread), the Greek spargáō, (to swell), the Latin spargō (to scatter or spread) and sparsus (scattered), the Lithianian sprógti (to germinate), and the Breton erc’h (snow). It is also related to the English words spread, spare and sparse. Spark has also been used to describe the particles thrown off by an electrical current since the mid-18th century, and the figurative sense, ‘a driving force’ or ‘someone who initiates an activity’ was first used in the 1940s. The verb, meaning ‘to emit sparks,’ comes from the verb and dates back to around the year 1200. The figurative sense, ‘to stimulate or trigger,’ first appeared in the 1910s.